Home repair expenses won't keep you awake at night when you know you've got a plan in place. Many people will become first-time home buyers this spring. Those buyers are probably running the numbers now: This much for the mortgage, this much for property tax, a bit more for utilities…. Some of them will get renovation loans that allow them to rehab a fixer-upperand make it fit for fine living, but many won’t think to include the cost of ongoing maintenance as they plan their new budgets. The adventure of buying a home was one that my husband and I approached with great excitement. We were ready to dive into gardening, outdoor entertaining, having a dog, and creating a space that was all ours. Like many first-time home buyers, we had a lot to learn. In addition to delving into our personal finances, we studied up on things like mortgage insurance, flood zones, and — after a particularly revealing inspection on a home we didn’t end up buying — foundation types. One thing that didn’t come up in our new-homeowner education: Budgeting for home repairs. While unexpected home repairs can strain almost any budget, being prepared for these inevitable costs promised deep peace of mind. We wanted to be the kind of homeowners who were prepared to replace a water heater or repair a roof without pulling out our credit card, so we began researching how much we should save each month to keep our home safe and sound. 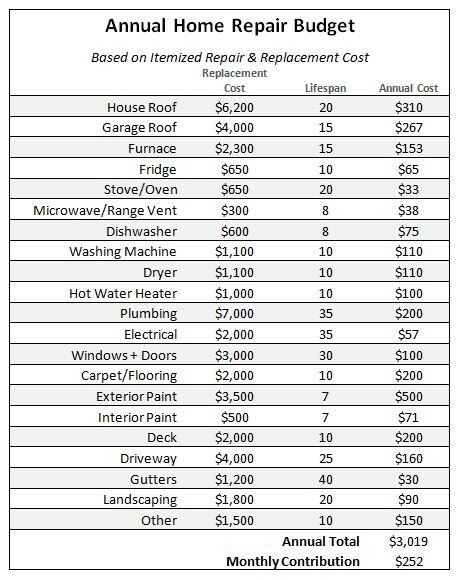 As part of our research, we tried out two different methods of estimating home-maintenance costs, and set up a successful home repair budget. Many experts advise setting aside between 1 percent and 4 percent of the assessed value of your home each year for repairs and maintenance. Maintenance costs for homes that are aging, remotely located (like island homes), or lavishly trimmed out with features like swimming pools can run toward the higher end. Our home didn’t fall under any of these categories, so we chose 1.5 percent (one of the most commonly recommended rates) when we set up our estimate. The assessed value (which forms the basis for property taxes) can vary a lot from the market value of a home. Knowing this, we also used our home value on Zillow to create our estimate. Assessed values are not always accurate. Home values can be affected by factors that are completely unrelated to actual repair costs (like the quality of the school district). The 1- to 4-percent savings rate range suggested by experts left us with some reservations. Our specific situation gave us additional reason to doubt the assessed-value method of estimating. Because we are close to great amenities like a commuter rail station and a walkable historic downtown, we could own a much larger home just a half hour away with a lower assessed value. This much larger home would be more expensive to maintain than our cozy abode, but a savings rate based on assessed value would have us putting aside less money. The only way to ensure our peace of mind was to test the accuracy of this repair-cost estimate. Testing the accuracy of our home-maintenance budget required figuring out the cost of individual home repairs, and the lifespan of things like paint jobs and furnaces. We live in an area with fairly high cost of living, so services aren’t cheap. Our house is very small (just 790 square feet!) so many repairs are less expensive. We usually buy our appliances “like new” from an outlet store. Our washer and dryer are in an extremely small space, and would need to be replaced with premium space-saver appliances. We are not experts in home construction and repair. When we weren’t sure how much to estimate, we used the Home Advisor True Cost Guide or talked with experienced friends. We also didn’t need this budget to cover the cost of small expenses like lawnmowers or minor repairs. We knew we would use our everyday spending money to cover these less significant expenses, and save our home repair dollars for when we truly needed them. The beauty of a customizable solution like this one is that we can update our savings goals whenever we have new information about our home. If we discovered that our roof should be replaced within five years, we could change the lifespan and instantly update our monthly savings goal. This method would be especially helpful if we owned an older home with several pressing repair needs. After all the time-consuming work of putting together the itemized estimate, it came out surprisingly close to using the assessed value method. This was especially true when we used our home’s market value instead of the value assigned by the Assessor-Treasurer’s office. Unless there are dramatic fluctuations in the housing market, we’ll be setting our savings rate based on our home’s estimated market value in the future. We’ll also be sure to update our savings goals each year to make sure the amount we’ve budgeted is enough to keep up with inflation. If we decide that something more than plain-Jane home maintenance is in our future, we’ll set aside a bit more to allow us to pay for remodels or renovations. These tools together helped us set up a successful home-repair budget. The money we contribute to our home-repair fund each month is a small price to pay for peace of mind.